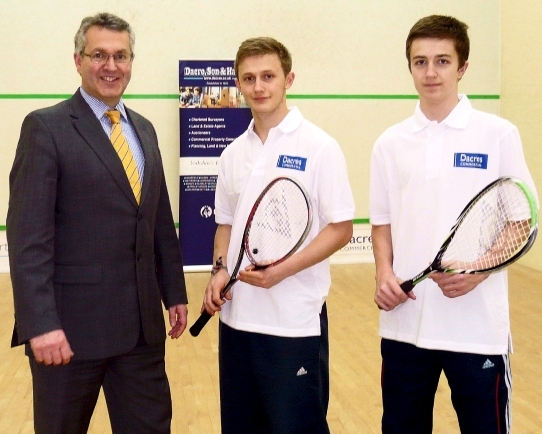 Yorkshire’s biggest independent estate agent Dacre Son & Hartley is providing valuable financial support to Ilkley Lawn Tennis & Squash Club following the announcement of a new headline sponsorship deal. The deal continues a very successful relationship of more than 10 years with the club. As a key headline sponsor, Dacre Son and Hartley will be providing substantial funds to support not only some of the adult squash leagues but also the grassroots junior squash and flagship squash performance programme. The performance programme at Ilkley is second to none and the funding will allow the club to talent spot and support budding young stars of the future within its performance programme. The Club has a strong and well proven track record and its top junior players include Stu MacGregor who is Yorkshire’s under 15 Champion and is ranked 7th in England and Jack Bearpark who is Yorkshire’s under 17 Champion and ranked 13th in England. Dacres are an invaluable partner and we are very lucky to have such a well-known firm backing the club. The funding secured means that children, who would otherwise have limited access to the sport, are able to participate and that talented players can be supported as they progress. The new sponsorship deal cements the strong relationship that Dacre Son & Hartley has with the club and reiterates the firm’s commitment to the local community. We are thrilled that our connection with the club continues and are very happy to be increasing our level of sponsorship. In 2012 we supported many local projects ranging from The Ilkley Rotary Pancake Race to the Yorkshire branch of The Wooden Spoon which supports disadvantage children. I am sure that both children and adults who sign up for squash and indeed tennis coaching courses will enjoy the fantastic facilities and thrive at the club. Game, set and match! from left to right Patrick McCutcheon, Chairman of Dacres residential and Yorkshire champions Stu MacGregor and Jack Bearpark.